Whilst I tend to cook a lot from scratch, I have been known to have the occasional cheat meal and not feel at all guilty about it. Puff pastry is one such cheat. I use this mainly to make tarts. A decent tart can be knocked up in just 30 minutes. 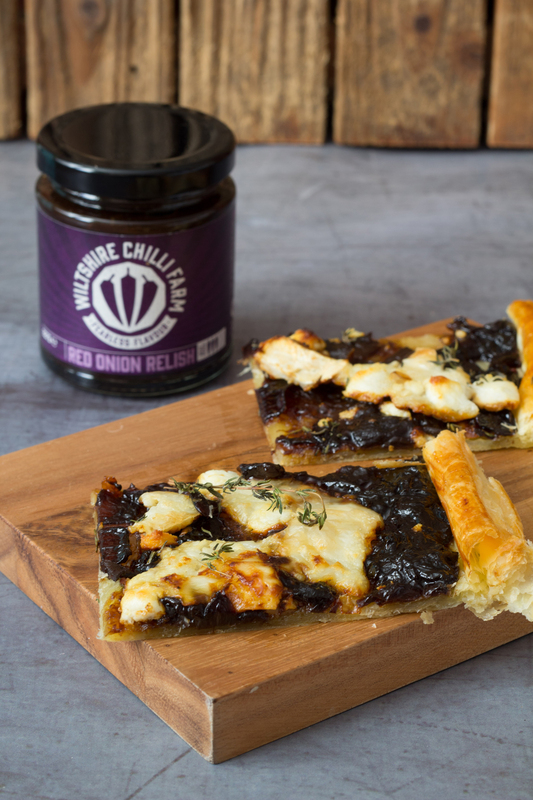 I’m quite partial to cheese and onion and I’ve teamed up with the folks over at Wiltshire Chilli Farm again to create a delicious Goat’s Cheese and Red Onion Tart. It uses their fab new Red Onion Relish. It’s super easy, no fuss and quick. Perfect for a starter, lunch time treat or for something more robust pair it with a bean salad. The relish has a warming chilli kick to it, great for these cooler months. You can check out their full range and other recipes online, or catch them at various stalls across the UK, USA and Australia. For Londoners, they have a permanent residence in Borough Market. Step 2 Place pastry on a clean kitchen counter and unroll the pastry. Step 3 Score a one-inch border around the pastry and prick the inside border with a fork. This helps the inside of the tart not to puff up when cooking. Step 4 Spread the Red Onion Relish evenly within the border and crumble the goat’s cheese and scatter some fresh thyme on top. Step 5 Brush the pastry border with egg. Place the tart on a baking tray and bake for 20 minutes until golden.